I had been especially eager to see Dead and Breathing, mostly because it purportedly tackled the important theme of “right to die,” and it sounded like a light-hearted approach to a controversial subject. Light-hearted it certainly was, if not all that controversial. Any attitudes the play takes on controversial issues are already set in stone, well beyond the debate stage. Once again: two superior actors, as expected. The acting talent has been consistently superb all weekend. This time Lizan Mitchell plays Carolyn, a crusty old woman dying of cancer, tired of being sick, and eager to get it over with. So right off the bat she solicits her new hospice nurse, Veronika, “with a K,” for help. Veronika, played by N. L. Graham, is both deeply “Christian,” and a viking of a tough broad. She is of course shocked and offended, and refuses, until … And there I either have to stop story-telling, or throw in a spoiler alert. And the play is way too much fun to even hint at what happens next. Speaking the truth, bluntly, and seeing it accepted, is one of the things the theatre does better than any other medium. And if recognizing and acknowledging those truths keeps us in gales of laughter, so much the better. In that regard, without trying too hard, this piece was the most successful of this year’s Festival. For only two small moments was there a pause in the loud laughter that otherwise filled the room for a solid eighty minutes. One was my fault … when my silenced phone suddenly decided to sound a very loud tornado alert, warning me to “get inside immediately.” And the other, when the play teetered on the edge of preaching on a subject the audience did not yet consider relevant. That unexpected new development turns out to be very relevant, of course, although Carolyn’s reaction to it seemed way over the top for such a down-to-earth woman. Once a playwright has come up with such an intriguing pair of characters, and put them through their paces in a challenging situation, and raised the ante a few times, there’s always the problem of how he or she gets it all resolved. Hence the popularity of contemporary plays and films that finish without resolution. 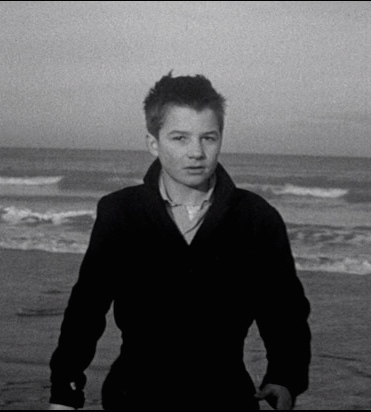 We end up with countless variations on Jean-Pierre Léaud’s famous “where can I go from here” stare out to sea in Francois Truffaut’s The Four Hundred Blows. But Miss Hutchinson has elected not to do anything like that here. As a consequence, she provides us with a little too pat a finish. 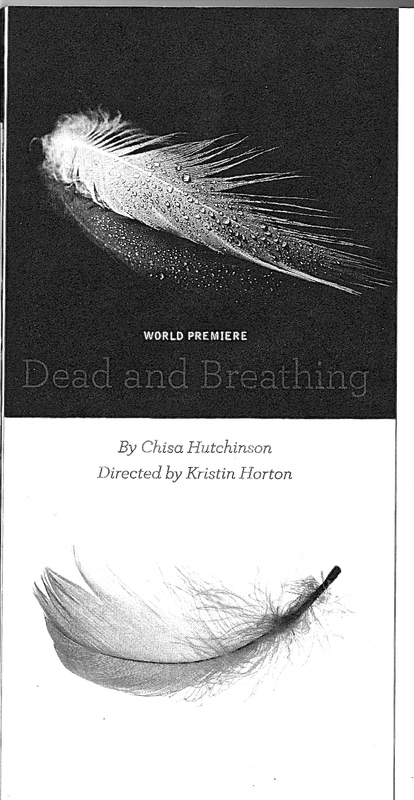 Not pat enough, however, to detract from a hilarious play that challenges current “norms,” attitudes toward dying, etc. It will surely lead to long discussions and debate among its audiences. This is the stuff of fine theatre. An after-thought: That “tornado” turned out to be a super violent wind and lightning storm, flying tree limbs, flooding, and the works. It struck Shepherd University just as we were leaving the theatre at the end of the play. Consequently, many of us stood and sat around for another half-hour or so, meeting and chatting with new friends and neighbors, while we waited for the storm to permit a safe walk to our cars. The discussions and debate generated by Dead and Breathing began immediately. For one new friend, for instance, Veronika represented the unlikely force by which crusty old Carolyn finally accepts Christianity. I didn’t really see Carolyn accepting much of anything in the play, but it would certainly be worth a longer discussion. It was great fun, and left me feeling such opportunities would be welcomed if regularly scheduled. And so, for us, ends the 2014 Contemporary American Theatre Festival. Should you feel tempted, it continues through August 3. We’ll surely be back for the 2015 Festival, looking to be challenged and surprised by new works, as yet largely untried and unproven. It is so reassuring to find not only these gutsy playwrights and plays, but to find this gutsy audience, willing to risk their convictions, time and money, for the chance of getting a fresh take on American life, far removed from the lights of Broadway, in a remote little West Virginia town. P.S. Dear readers, I welcome comments, “likes,” and disagreements on these posts. Please share them with friends, and up there in the upper right corner, you’re more than welcome to subscribe to be notified of future entries. This makes my 100th post in almost four years. And as you can see from my history, for a blog, posts will be relatively rare, and come in bursts. Why not open up a dialogue? This entry was posted in Rants, Theatre and tagged Antoine Doinel, CATF, Chisa Hutchinson, Contemporary American Theater Festival, Francois Truffaut, Jean Pierre Leaud, Lizan Mitchell, N. L. Graham, Shepherdstown WV, The 400 Blows. Bookmark the permalink.